Vitex (also know as chaste tree) is often said to be great for fertility, but is it for everyone? You’d think so by reading fertility forums and blogs! But often times it can make a woman’s symptoms worse. Join Kelly LeGendre and I as we talk about vitex; what it is, how it works, who should take it (and who shouldn’t), as well as proper usage. 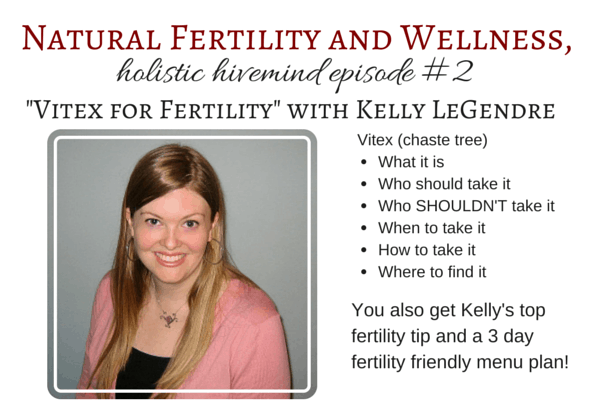 Kelly LeGendre, the creator of The Fertility Fix program, is a licensed acupuncturist and herbalist who has been helping women grow their families naturally for over a decade. After the birth of her son (who was conceived while following the first iteration of The Fertility Fix plan! ), she left her acupuncture practice to focus on helping make motherhood a reality for other women worldwide. Kelly uses a research-based approach to naturally optimize fertility through a combination of functional nutrition, lifestyle modification, and herbal medicine. You can find her website at TheFertilityFix.com and she is also on Facebook. Do everything in your power to reduce your stress level! Women don’t realize what a huge effect stress has on their hormone levels, but it takes whatever else is happening inside your body and amplifies it. Stress increases insulin resistance, interferes with thyroid function, lowers progesterone, makes it more difficult for your liver to break down excess estrogen and other toxins, and causes inflammation by impacting gut health. No matter how much you clean up your diet, if your stress level is still through the roof, your health (and fertility) will suffer. Not an exact transcription, so check out the video for the entire conversation, but here are some of the main points from our talk! Vitex, also known as chaste tree, is a bush/herb native to the Mediterranean. The berries are used in herbal medicine. What actions does it have on the body? It works on the hypothalamus to stimulate dopamine production and when dopamine is up, it suppresses prolactin which has a cascading effect to raise progesterone. It can be useful in women with progesterone deficiency issues, but Kelly always tries to use other options to raise progesterone first. Is this a herb for both men and women? No, this herb is for women only. It may decrease testosterone and impair sperm motility in men. Vitex does have a slight estrogenic effect, but it tends to raise estrogen and progesterone at the same time. So women with high estrogen want to be wary taking it. What reproductive issues should we be taking vitex for? Kelly uses it primarily for luteal phase defects (where the second half of the cycle after ovulation is too short). Vitex is usually only used after options haven’t worked. It’s also important to know that dopamine and progesterone have the same precursor hormone, pregnenolone. And if you are low in pregnenolone, she tries to raise those levels first as vitex will force the body to produce more dopamine which could cause deficiencies in other areas causing a “crash” later. What other natural remedies should be tried first? Lifestyle – Pregnenolone is also used to produce cortisol, and if you have high levels of stress for a long period of time, the body uses this precursor for stress instead of progesterone production. Women tend to gloss over this recommendation and move on to more exciting remedies, but reducing stress, and figuring out better ways of dealing with it, are really important and make a big difference. Diet – Consuming a lot of vitamins and minerals as well as good fats is important in hormone production. Sugar needs to be cut out as it can cause the body to preferentially produce serotonin instead of dopamine. Caffeine needs to go as it can raise cortisol levels. A focus on whole foods is important. Supplements – replacing nutrients you may be deficient in can also be helpful. Magnesium, zinc, B6, and vitamin C can all help in the production of progesterone and its precursor hormones. Can vitex be used for PCOS or annovulation? PCOS responds so well to diet and lifestyle changes that those should be primary in those experiencing PCOS. Because they aren’t ovulating progesterone will be low. But once we can get them ovulating through dietary changes, then we can look at progesterone levels and see if they have any luteal phase problems. What is the best form to use – tea, capsule, or tincture? Alcohol extracts the constituents from the plant so tinctures are going to be your best bet. It’s important to work with someone who knows the herb well as they can figure out the correct dosage for your situation. Normally Kelly recommends about 30-40 drops per day in water, upon waking, and on an empty stomach. How long does it take for it to have a positive effect on the body? It normally takes about 3 months to see any changes due to vitex. Should you take it throughout your whole cycle, or just post-ovulation? Is it bad to take along with other herbs or supplements (what about Maca)? No known contraindicated herbs for vitex, but maca seems to be another overused herb right now. The only research done on maca in women is to raise estrogen levels post menopausally. Women with early menopause or premature ovarian failure may have good results with it, but if a woman has low progestersone the last thing they need is more estrogen in their systems. And because they do opposite things, there is no need to take maca and vitex together. If you are taking hormones or going though medicated cycles for assisted reproductive therapies, you shouldn’t be taking herbs that help to balance your body’s hormones. The herbs are trying to naturally balance while the prescriptions are trying to take over and do what needs to be done so it’s counter-productive. If you are taking it while trying to conceive, can you continue it during pregnancy? This is really something to talk to your midwife or OB about as there are no studies that show it’s safe…and yet there are no studies that show it’s unsafe. The concern with going off of it abruptly is that vitex is artificially getting your body to produce progesterone and if you stop taking it without using supplemental progesterone it could make miscarriage more likely. Other alternatives are progesterone creams or prescriptions. Vitex and breastfeeding – should you take it while breastfeeding and does it reduce milk supply? Not aware of anything that has shown that it can bring back cycles while breastfeeding. But it has traditionally been used to increase milk supply in the immediate post partum period, and yet at others times it can be used to reduce prolactin levels – it all depends on the individual situation so check with a practitioner that knows the herb. There hasn’t been really any research that has proven it safe or unsafe, but taking herbs that affect hormones makes Kelly somewhat wary as it’s not something you really want to pass on. Vitex can make depression worse, and in some cases can even promote suicidal ideation. So women who have a history of depression should be VERY cautious with it. This is especially true for low dopamine-type depression, the symptoms of which include apathy and having a really hard time getting excited about anything. The diet I recommend to my clients centers around real, whole foods. You need plenty of good fats and protein to create the hormones needed to conceive and sustain a healthy pregnancy, so I try to include a wide variety of them. I also focus on LOTS of veggies to provide necessary vitamins and minerals, plus the micronutrients and fiber that are needed to break down and remove surplus hormones and other endocrine disrupting toxins from the body. Cruciferous veggies are especially good for helping the body eliminate excess estrogen, so I try to include some everyday. Sugar, alcohol, and caffeine have been proven to have negative effects on endocrine balance, so I recommend excluding them completely while trying to conceive. Meat, eggs, and dairy should always be grass-fed and organic to avoid added hormones and maximize good fats, and fruit and veggies should be organic when feasible. While my plan isn’t paleo, I highly recommend Melissa Joulwan’s paleo cookbook, Well Fed, to anyone trying to transition to a way of eating that includes more cooking. In it, she outlines what she calls the “weekly cook-up”, where you basically spend an hour or two once a week grilling chicken, browning ground beef, prepping veggies, and making a few sauces, then all week-long all you have to do is throw a few things in a pan with a little oil and some spices, and voila—dinner is done in 10 minutes flat! Melissa’s got a quick primer on her website, plus links to recipes and a few meal plans with more detailed info and shopping lists here . I’ve started doing a weekly cook-up recently and it’s absolutely revolutionized the way I cook (and eat), because I always have something on hand that’s healthy and quick to prepare. To save even more time, make enough at dinner to have leftovers for lunch the next day. *as with any dietary changes, see your health care provider (preferably a holistic practitioner) for personal recommendations. If you have any questions concerning vitex that we didn’t answer, please feel free to ask in the comments and we’ll get it answered as soon as we can! Thanks Donielle & Kelly! About the depression on Vitex, would that include PMS depression (or maybe it’s considered PMDD)? I only seem to have depression the week between ovulation & my period. But depression runs in my family and I lost my mom to suicide so I’m super sensitive to it. Mrs K., depression during the premenstrual phase is usually linked to progesterone and dopamine levels since that’s the time in your cycle when progesterone is at it’s peak. I’ve be very cautious using vitex with a history of premenstrual depression. Try supplementing with the vitamins and minerals I mentioned in the interview (magnesium, zinc, B6, and vitamin c) for a few cycles and see if it helps with the depression. If it does, you’ll know you’re on the right track to naturally increasing your dopamine (and progesterone) levels. I have been on vitex for 20 days . I’m feeling irritable , exhausted , emotional and moody as I usually would one week prior to my period . I’m due for my period in a week . My doctor put me on vitex after taking lexapro for 10 weeks with no improvement which I have also been off for 2 weeks now. I have history of depression and anxiety and it runs in my family extremely too. Should I stop the vitex immediately? I have a perfect cycle but who knows now after taking vitex for the past 20 days . Hi Kelly, I know this is an older post so I hope you still respond to comments. How much of each mineral do you recomment as in mg? Thank you. I was wondering what are the side affects when you stop taking vitex and how long do you recommend someone to be taking it? I’ve been taking it for 7months and it as helped regulate my cycle great but I haven’t conceived yet and was wondering if I can stop and my cycle would stay regular or what would happen? Hi Kari. It usually takes three to six months to see the full effects of the herb, so if you’ve been taking it for seven, you’ve probably seen what it’s going to do for you. If it’s regulated your cycle and you’re feeling ok on it, you could probably give it a couple more months if you wanted to. If you feel like it’s not doing anything for your fertility and you’d like to stop taking it, I’d recommend reducing your dose for a couple of weeks before stopping. So if you’re taking three pills, cut back to two for a week, then one. If you’re taking a tincture, take half your normal dose for a week, and then half it again. It’s hard to say if you’ll see any side effects while quitting, since everyone reacts a little differently. Tapering off should help. If your cycles become irregular, it may take up to three months after quitting the herb completely before they settle back into a normal pattern. I have been taking vitex to regulate my hormones and to help hurry back an absent cycle. I am still nursing, and I plan to continue even up to pregnancy, if it happens. Since I am just slowly weaning, by the way my baby is 23 months, I am not exactly sure how long my luteal phase is because I haven’t started a cycle yet. I have a whole food diet, low carbs, no sugars, no high starch (gaps diet), would you recommend no vitex until I see if I have a luteal phase defect? Thanks for this really helpful information. I finished breastfeeding my 2nd child 7 months ago. Since then my cycle has been very irregular and I have a luteal phase of 6 or 7 days. I am taking 25mg a day of b6 (as part of a b complex supplement) and a high strength vitamin c supplement every day in addition to a conception multi vitamin. I have been doing this for a couple of months. I have bought a vitex tincture, but haven’t started taking it as am worried it could make things worse. I have followed a whole food diet for the past couple of months too. Do you think I should start taking vitex or up my b6 intake first to see whether that has an effect? This is such a wonderful resource; thank you very much! What are your thoughts of taking Vitex and myo-inositol together to treat PCOS symptoms? The inositol would be taken daily, and the Vitex just during the second half of cycle. i think inositol would be great to take. never been able to afford the gamble tho. i would take it while taking vitex. i also took saw palmetto but never saw a thing change. the vitex did nothing for my hirsutism & scalp hair loss. great info all in one place about my favorite herb! i took it for a long time before seeing anything change, age 38. wasnt trying to conceive but then i got married a yr later and conceived about 7 mos later. i still wasnt trying to concieve per se, but wanted to keep my periods regular (i have pcos). i got to the point where i divided up the dose into one dropper in a.m., one dropper in p.m. and that brought my once-again lengthening cycles back to normal. now at 51 (with another baby delivered 9 yrs ago) i am like clockwork still even tho i never took it again postpartum with that last baby. As soon as I tested positive for a pregnancy I would stop the vitex. I could find no studies on its safety. I didnt taper off it. Thank you for this wonderful video! So much great info, thank you for laying it all out! I am finding this at the perfect time. I have a question. I have been using 800 mg Vitex (400 mg morning and night) in addition to Pregnancy Prep by Vitanica (1 pill, twice daily = 430 mg Vitex) – for approx. 1230 mg total Vitex daily. I am also taking 1/2 tsp of maca every day. I was using it to bring back my periods, which I had not had in six months since stopping breastfeeding (daughter was 17 months when I stopped breastfeeding). It brought on my period after 3 months of using it, but I have continued to use it and I feel that my estrogen is staying high and I still have not had a second period (currently on day 38)! I am constantly really hot, feeling bloated, water retention, gaining weight in my thighs, and my ovulation ferning microscope (which measures estrogen) consistently shows a partial ferning pattern now since day 18 – full ferning on day 21, then partial again until now). Any guidance or advice is really appreciated. I am at a loss and am thinking about stopping all of my supplements and just letting my body naturally balance itself. I should also note that I am super healthy – healthy weight, all food is organic/grass fed, paleo diet with lots of good fats and protein and tons of fresh veggies. Did you stop taking the vitex? I’d love to hear if you’ve found anything that worked for you! I’m 4 weeks pregnant and have been taking vitex one tablet daily for 6 months. I just ordered progesterone cream. My ob will say stop right away because he’s not familiar with herb. What is proper way to wean off vitex to cream and at what week? Are they say to do together while pregnant? Very confused on this. I’m not an expert, and I’d say you’d have to call a holistic practitioner to find out for sure, but my thought process would be that the progesterone would do the same thing you’re trying to get from the vitex, right? I’d think it would be fine to stop once you’re using the cream. But, like I said – check with a qualified practitioner! It was suggested i take vitex from day 12 of my cycle to increase my l.p. After 2 miscarriages 3 cycles apart. My cycles were regular at 35days to the minute and apart from one headache 1day before my period i never experienced pms symptoms. My last cycle was hell. Daily headaches from day 15, nausea developed from day 18 and continued until bleeding at day 35. My face had never been so oily and depression set in around day 31. I’ve never felt so helpless, desperate and considered not going on. Is it possible that the vitex caused these symptoms? Would there be any long term effects of vitex was the cause? Some women do have negative symptoms when on vitex. Normally they subside once they stop taking it. Vitex will work differently for each woman, so while it’s been known to lower prolactin levels in some women, it’s too hard to make general statements and say it it would work for you. It’s best to work with a qualified herbalist to make sure it’s the best herbal choice for your needs. I took vitex for about a year and a half. My skin cleared up and my cycles got shorter and with less clots. I however fell into a deep depression that I am only slowly getting out of. I stopped taking vitex in April of this year and still do not feel 100%. I really would not recommend it to anyone who has been depressed before. I literally felt like my life was sucked out of me!! I starting to feel better slowly but it has taken ages and much feelings of saddness and helplessness. Antonia – I’m so sorry you experienced such a negative symptom! It really goes to show that herbs can be very powerful and must be used with care.